Sweating is essential for our bodies to release toxins! Studies show that sweat is an effective way to eliminate toxic elements from the body. But what about maintaining hydration? How do we maintain proper electrolyte balance? Doesn’t sweat release good stuff too? It does! So what do we do? As a general rule, you should be drinking at least half of your body weight in ounces every day. So, someone who weighs 160 lbs. should be drinking at least 80 oz. of water every day. I like to keep my 32oz Hydroflask on hand at all times of the day, and try to drink 2-3 full bottles every day! Try to find a system that works for you to monitor how much you’re drinking every day. Chances are that if you’re only drinking when you’re thirsty, you’re already dehydrated. On days that you’re sweating a lot from being outside or exercising (especially hot yoga), it can be a good idea to supplement electrolytes. Electrolytes such as calcium, chloride, magnesium, phosphorus, potassium and sodium have key roles in the body. Muscle weakness, muscle cramping, fatigue, irritability, and headaches are just some of the symptoms of electrolyte imbalance. 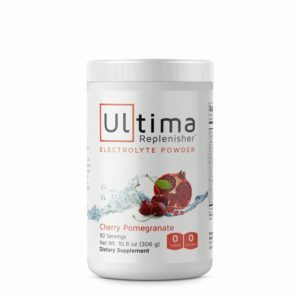 If not choosing Ultima, make sure to choose an electrolyte supplement that has no artificial colors, flavors, or sweeteners and stay away from high fructose corn syrup!